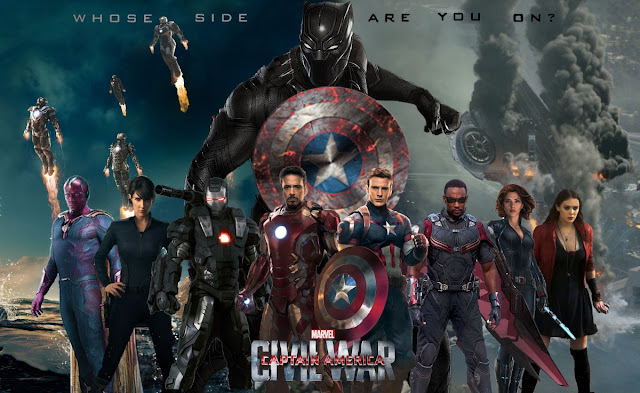 Movie Ramble: Captain America: Civil War. Another cracking superhero movie directed by the Russo Brothers Anthony and Joe involving the Marvel Cinematic Universe. This latest action packed offering is almost a direct follow on from Captain America: The Winter Solider released in 2014 in which we had the emergence of an all-powerful villain who was originally Steve Rogers’s (Chris Evans) best friend Bucky Barnes who was thought to have been killed in action during World War 2. Rescued by the Russians and taken to Moscow he is programmed to be a Soviet assassin under the code name of The Winter Soldier (Sebastian Stan). This latest film involves not only characters from the previous outing including the good Captains love interest Peggy Carters niece CIA agent Sharon Carter (Emily VanCamp), Scarlett Johansson reprising her role as Natasha Romanoff/Black Widow with Anthony Mackie back as the flying machine Falcon but others that form part of the larger Avengers Assemble including Iron Man (Robert Downey Jnr), Iron Mans close ally War Machine (Don Cheadle), with Jeremy Renner returning as Hawkeye, Black Panther, a new character introduced for this movie played by Chadwick Boseman, Vision the Android (Paul Bettany) the lovely Olson sister Elizabeth is Scarlet Witch, also the super hero Ant-Man (Paul Rudd) whose suit allows him to shrink or grow makes an appearance - you may already have seen him in Ant-Man (2015), bringing some welcome humour to the proceedings is Peter Parker better known as Spider Man (Tom Holland). The plot of Captain America: Civil War (2016) involves the introduction of the Sokovia Accords which basically set out to kerb superhero involvement in operation’s they deem necessary i.e. to ‘save the world’ and protect the innocent’s against the villains, who these days tend to come in the guise of big business and corrupt authorities, forcing Captain America and his fellow crime fighters to accept political oversight – and we all know how dubious political oversight can turn out to be! When our superheroes can’t agree on the benefit of the Accords civil war breaks out forcing them to choose sides. Cue massive exciting and destructive battles between the two factions. “This is the cinematic superhero showdown you’ve dreamt of since childhood” The franchise gets even better, great entertainment for children of all ages. Robbie Collins Daily Telegraph April 2016.